Andy Simpkins tours the World War 1 battlefields of France and Belgium, September 24th - 26th 2004; A Remembrance Day Travelogue. As the saying goes: 'You have to be there to believe it...' and the poem above, written by a Canadian Lieutenant-Colonel called John McCrae can offer some slight testimony to the Charnel House that was happening around him. Mere words cannot conjure up the images of carnage that turned the rolling fields of northern France and Belgium into a place of mass destruction and the sheer volume of life that was taken in those years between 1914-1918. 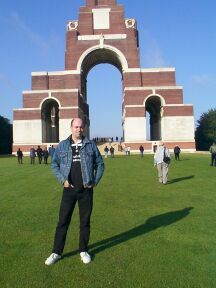 My mother took my late father out to France 8 years ago for him to witness the events and ceremonies that marked the 80th anniversary of the commencement of the Battle of The Somme. A few months ago, my mother asked me if I would like to accompany her back out there again and I readily agreed as I have not been out of the country for a while and I believed it was a trip that was worthwhile in taking. Upon disembarkation and the trip through French customs, our coach motored out of Calais and onto the A-roads that are the equivalent of our motorways. Our tour guide, a lady by the name of Linda Bailey, informed us that our first port of call would be to the Musee De L'histoire De La Grande Guerre at Peronne. The Somme, for those of you who did not know, is one of the counties, or as the French call them;departements, of Northern France and is an area of low, rolling countryside given over now to extensive arable use, agriculture and industrial use, such as coal-mining. This was confirmed by some of the giant slag-heaps that we saw as we drove past. Some were so high and well established that they had mature trees growing out from the side of them and the departement takes its name from the River Somme which cuts a meandering path through the countryside of that area. 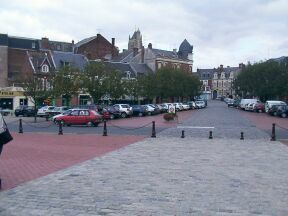 Peronne is an old town, about an hours drive from Lille where we were staying for the duration of our trip. Upon parking in the town square, we got out of the coach and had a short wander around the town before going into the museum. 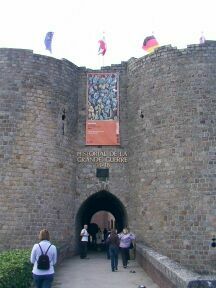 The actual museum is built within the walls of an old fort and was very modern and spaciously laid out with clearly marked sections signposted in both French and English showing the pre-war exhibits, artifacts taken from the field of battle and the post-war exhibits. A section I took particular interest in was a selection of uniforms worn by the French, Commonwealth and German troops laid out in display areas sunk into the floor. These were surrounded by the armaments and field equipment necessary for a prolonged stay out on the field of battle, such as mess tins, emergency rations, water bottle, first aid kit, ammunition, backpack and a host of other things as well. 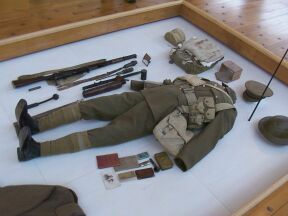 This assembled collection weighed about 50 pounds and you could only imagine what it was like to have that on your back when you had 'gone over the top' and were charging through No-Mans Land, avoiding bullets and exploding shells in order to fight the enemy troops. This introduction to the trip served me and my mother well and all too soon, it was back on the coach in order to make our way to our next destination half an hours drive away. Delville Wood, or as the Allied troops called it;Devils Wood, is a fairly large and prominent copse of trees and woodland half an hours drive from Peronne and several miles south of Bapaume, one of the major towns of that area. This was a scene of heavy fighting in the offensive to capture that area, and all too often, the trees had been razed to the ground by exploding shells and the ground was heavily pocked in places with the overgrown remnants of shell craters, even though in the years after, trees and hedgerow had grown back over in an attempt to heal over the scarred landscape. Nearby was a memorial and cemetery commemorating all the South African troops who had fallen in that area. 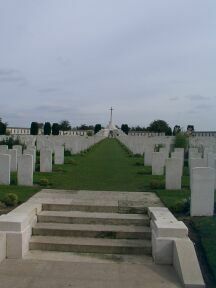 It was very sad to say but one thing you could not miss was the sheer amount of cemeteries dotted around the area, immaculately tended by employees of the War Graves Commission. The numbers of fallen soldiers interred in these places depending on what part of the countryside you were in, could range from a few hundred to several thousand. These were the ones who were recovered after the hostilities had ceased but on many walls, there were plaques and wallspace listing the countless others who had no known place of rest. A short drive away was the next site on the list. 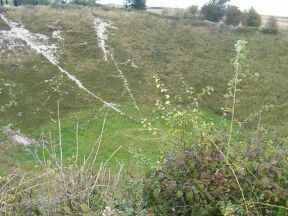 This was Lochnaghar Crater and serves as mute testimony to what the power of of the enemy artillery can do. As I said previously, the landscape around the area I was touring consisted of either very flat plains or gently undulating hills and it came as a surprise to see a shell crater, caused by one single exploding shell, over three hundred feet across and almost a hundred feet deep. Any soldiers who were in that area at the time of the explosion would have stood no chance and even those on the periphery not killed by the concussion, would have fallen in. The area has a very high water table and the crater would have qiuckly filled up with muddy water and those not lucky enough to scramble out in time would have slid to the bottom and drowned. After spending an hour or so looking around, it was time to get back on the coach as it was late in the afternoon and we had about an hours drive to the hotel at a place called Villeneuve D'Ascq on the outskirts of Lille. The Hotel Morphee is a modern hotel and the surrounding area is part of the new town on the South-East of Lille. Our tour guide informed us there were a couple of restaurants just down the road from the hotel and so my mother and myself went out for a bit to eat. I was looking forward to practicing my French and as soon as I walked in the door with mum in tow and asked for :'Une table pour deux personnes et le menu de la jour, s'il vous plait. ', the waiter promptly asked me to follow him and wished us an enjoyable meal and evening in fluent English. On my previous trips out to France and Belgium, this linguistic clash has always left me with a slight mental short circuit. I can adhere to the time-old adage of:'When in Rome...' and stick to speaking French or behave like most English types and speak our mother tongue for the duration of the trip. English might be a universally spoken language but I cannot help but feel that it has made us rather lazy in making the effort of speaking the host nations language. Oh well, c'est la vie... . After checking in, I went to my room. Call it uncanny but whenever I stay in hotels, my room number on the majority of occasions, always seems to be 42. I don't know what Arthur Dent and Ford Prefect would have made of it and nor did I, as soon as I unpacked, it was a case of hitting the hay after a long days traveling and walking about and I was too tired to ponder upon the eternal question of Life, The Universe and Everything. However, I think I saw a couple of white mice looking at me from a corner of the room before I crashed out for the night! My first night in a strange bed is always a fairly restless one and this was no exception. I have stayed in hotels on numerous occasions and there is always a certain amount of nocturnal activity, no matter what the hour. I always get the impression that the walls are made of very thin layers of cardboard and tissue paper as everything in my corridor was amplified including the activities of a few of the married couples who were on the trip with me. Short of stuffing the pillows in my ears to shut out the sound of rhythmically squeaking mattresses, I could only close my eyes, curse them roundly as they were participating in activities I have not indulged in for a period of time and think of England until I drifted off. After a surprisingly restful night, I arose at 7:15 to shower and dress. Plodding next door, I banged on my mothers room door for it to be opened by her asking me why I had taken so long. Breakfast was a typically Continental affair with a selection of cereals, French bread and toast and coffee by the gallon for those who required it and at 9am, it was out to the car park for our first stop of the day. This involved crossing the border into Belgium and going on to a picturesque town called Poperingue where we were to visit Talbot House, otherwise known as 'Toc. H' by visiting soldiers. During the First World War, this was used as a place where soldiers could spend some much-needed leave-time and find some rest and relaxation. Only the shell of the house remains and it has now been converted into a museum where one could wander around and look at displays showing how an off-duty Tommy could rest and relax. 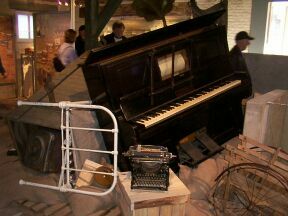 On the first floor of the house, all the available floorspace had been cleared and a stage had been set up at one end of the room where the soldiers could set up impromptu concerts and music hall acts in order to provide some much-needed entertainment and light relief. For those who were seeking relief of a more spiritual nature, the top floor of the house had been converted into a makeshift chapel where soldiers could go to find peace and religious solace from the battles raging mere miles away. Upon their arrival in Poperingue, a soldier fresh off the battlefront was directed to the bath-house in the grounds of Talbot House. After weeks or even months in the same uniform, they were usually infested with lice and needed to be taken away, washed and fumigated. After having a good scrub in the communal bath, a soldier was then issued with a cleaned and pressed uniform and only then was he allowed entrance to Talbot House. However, most off-duty soldiers were only interested in visiting the local bars and indulging themselves with the local ladies of easy virtue but Talbot House provided some much-needed peace after weeks on the battlefront. Next stop was a short drive away at a place called Essex Farm. During the hostilities, Essex Farm was what known as an advanced dressing station. These heavily concreted and fortified bunkers were used as field hospitals for the most severely wounded soldiers brought in from the front. Many a time, a field surgeon had to exercise triage practices and decide who were the most needy of treatment and perform surgery upon them. The bunkers themselves were very small and only allowed space for a small team of doctors and operating staff to work in. All this had to be done by candlelight and what daylight came in through the door and all throughout, shells were constantly raining down. It is almost inconceivable what they had to go through in order to operate on a soldier in order to save his life and in such confined space as well. As I mentioned earlier, Lt. Cmr. 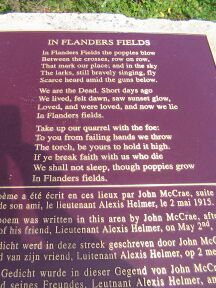 John McCrae wrote his emotional poem;'In Flanders fields' here and he knew only too well what the horrors of war were like. A short distance away, over the Ieper (Ypres in Flemish)-Ijzal canal, lay what were the German front lines. 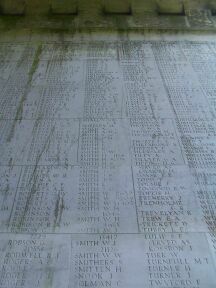 Our next port of call was to the only German cemetary on our intinerary at Langemarck. 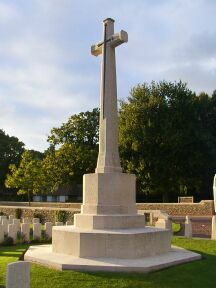 Whereas the Commonwealth cemetaries were laid out in open fields and each grave had a white upright headstone marking a soldiers final place of rest, the Langemarck cemetery had black headstones laid directly into the ground and the whole area was in the middle of a small forest of Oak trees. In contrast to the Commonwealth cemeteries which had an all-pervasive aura of peace and tranquillity, I found Langemarck to be slightly oppressive and I must confess that I was slightly relieved to be back on the coach afterwards. Needless to say, all the German soldiers commemorated there were someones son, husband or brother and it was treated with the reverence due to a Commonwealth cemetery as well. After a short visit to Tyne Cot Memorial (so called because the houses on the ridge that the Allied troops were attacking, in silhouette, resembled coal miners cottages in Northumberland), it was off to the medieval town of Ypres. After passing through the Menen Gate (more on that later) and entering the historic town, we parked outside the gothic building known as the Cloth Hall which used to house the town council, we were allowed a couple of hours to wander around the town. 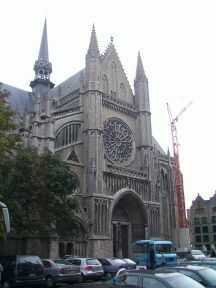 Ypres (or Ieper, depending on what language you are speaking at the time) is a showcase of Gothic architecture as the Cloth Hall and the church nearby show. All the houses in the surrounding area are built in the typical Flemish/Dutch style:tall with 3 or more floors and narrow as well and was built around a large and spacious cobbled pedestrian-only square. 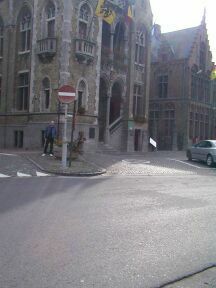 The symbol of the town of Ypres is the humble house cat. The reason for this is that back in the Middle Ages, the Cloth Hall was the centre of the cloth and weaving trade for Belgium. Where there is cloth and raw cotton, there are also mice and hence the need for cats to wander the Cloth Hall to keep the mice population in check. But when the need for cotton decreased, there was no need for cats and the poor animals were subjected the barbaric ritual of being carried up to the top of the clock tower and cast down into the street below. However, nowadays, this ritual is repeated with cloth effigies as these are more enlightened times and , understandably, there would be a public outcry if real cats were used in this yearly ritual. After grabbing a quick coffee in one of the pavement cafes and nipping into one of the many chocolatiers for a few purchases that were dotted around the main square, it was back on the coach to our next stop, a short drive from Ypres called Sanctuary Wood. During WW1, this area was used as a rendezvous point for Allied troops who, in the middle of battle, had inadvertently strayed from where their company or battalion was fighting, and so could meet up with fellow soldiers and get redirected to where their comrades were. Unfortunately, the German forces had found out about this and Sanctuary Wood was also very dangerous as there were always snipers stationed there to pick off any stragglers that had got separated from their company. After an hour or so looking around Sanctuary Wood, it was back on the coach to return to Ypres in order for us all to grab a bite to eat and then make our way to the Menen Gate for the nightly sounding of the Last Post. Menen Gate is a very large triumphal-style arch that was constructed about 10 years after the cessation of hostilities, about 80 feet high and straddling the main road into Ypres and has a large enclosed area on the interior. 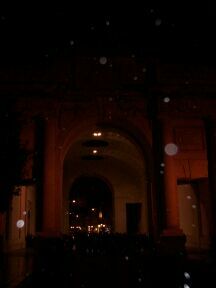 On the inside of the archway, are carved the names of the 55, 000+ soldiers who died defending the town and the sounding of the Last Post is a nightly ritual that has been carried out without fail since 1928. We were told to get down there at 7:30pm as there was always a large crowd gathered for the ceremony and should get down there with plenty of time to spare in order to get a place near the front. The ceremony took about 20 minutes and a hush fell over the 400-odd people who had gathered there. A selection of local dignitaries made a few short speeches and then a quartet of buglers sounded out the moving tones of the Last Post. After this, poppy wreaths were laid by, amongst others, a trio of British soldiers who had just finished their 18 week basic training and children from a British school who were out in Belgium for this purpose, in one of the two alcoves devoted to the laying of floral tributes. A simple, not over-long and very moving ceremony, I thought, even though someones mobile phone started ringing halfway through the ceremony and was hastily turned off. cue for the assembled crowd to start talking animatedly amongst themselves and a small crowd of people to wander up to the buglers for a friendly chat before going home. Upon arrival back at the hotel, several of our party met up in the lounge to discuss the days events. It had been a long but eventful day and I was in need of a libation or two. The bar in the hotel was a rudimentary affair consisting of one pump for beer situated at the far end of the reception desk and a fridge nearby containing French and Belgian bottled beers. I sampled a few demi-litres of a regional brew called Ch'ti (yes, pronounced 'sh*tty' but was anything but!) and a couple of bottles of the lethal locally brewed Trappist ale before making my way to my room for a very restful night indeed. Paranormal service will be resumed the following morning. Merci bien et bonne nuit, mes amis! After a very restful night and a very filling breakfast, it was out into the car-park again and our first stop of the day, a short drive over to Pozieres Ridge and the Thiepval memorial. We had seen it from the coach the the previous day in our travels around and even from a distance it is an imposing sight. On our way there, our driver;Paolo, had the unenviable task of steering a 40-foot long coach down some very narrow roads indeed with some sharp bends and curves and I must tip my hat to him for the miles he covered throughout the duration of the trip. The people of that region still remember the cost in human life and the debt they owe and, by way of recognition of this fact, we passed a cafe on a street corner aptly named 'The Tommy' by way of tribute to the British troops. The people of that area are accustomed to seeing British coach parties touring that area and looked on with detached interest as yet another party of rosbifs passed by on their way to one of the memorials that were scattered over the landscape. Seeing the Thiepval Memorial in real life was even more breathtaking as it is easily one of the largest memorials in the surrounding countryside. As you will see from the attached photo with me standing in front of it, you cannot get a true impression of its size until you are close up to it. 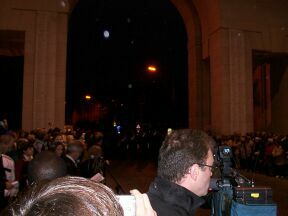 An idea of the scale of it is shown by the people standing in one of the archways on the memorial. 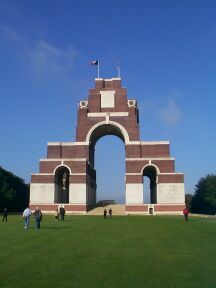 We also had a more personal reason for visiting Thiepval Memorial. My paternal grandfather was killed in action on the Somme and his name is one of the many thousands carved into the stone of the piers of the memorial. My mother had brought along a poppy cross and we had the location of my grandfathers name on the memorial. If ever you go on this trip we had taken , go to Pier 13, section B and then look for the Kings Royal Rifle Regiment and looking down the 'S's, you will see Thomas William Simpkins. I must comfess it was an emotional moment for both of us as my mother laid the cross at the foot of the column of names where my grandfather was commemorated but afterwards, when we were back on the coach it made the whole trip even more worthwhile. 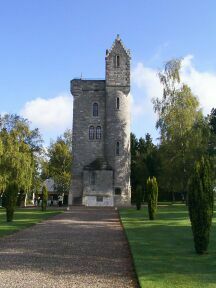 By this time, all the coach parties collective stomachs were starting to rumble and it was then over to Ulster Tower. This area was another heavily fought over area and the soldiers who made up the bulk of the Allied Forces were from Ireland. At that time, the soon-to-be province of Ulster in Ireland was in the throes of skirmishes between the separatist movement otherwise known as that collection of cowardly scumbags;the IRA, and those people who still wanted Ireland to be part of the Union. When the call to join up was heard, a lot of people did not want to join up but there were still a lot of loyal Ulstermen who wanted to fight for King and Country. Ulster Tower is a monument built in honour of those Ulstermen who fought and gave their lives in the fight for that contested area and is in the form of a picturesque fortified tower and keep, some 70 feet high, overlooking the surrounding countryside. A small gift shop and cafe had been built alongside the tower and our everthoughtful tourguide;Linda, had phoned ahead a few hours earlier in order to place an order for baguettes of various fillings and other refreshments for our party. Earlier, a list had been passed around the coach and we were told to take our pick from a variety of fillings for our baguettes. Upon walking into the cafe, all semblance of the dignified English habit of queueing for food almost vanished and it was a mad rush reminiscent of the demented seagulls in the Disney/Pixar animated movie;'Finding Nemo' with everyone shouting out '... Mine!. . Mine!. . Mine!...' whenever a baguette was held up! After order was restored, everyone marched out onto the verandah of the cafe to the picnic chairs and tables provided to munch happily on their baguettes and take time out while sipping coffee to idly chat amongst themselves and to admire the rolling landscape and farmers fields that was spread out on all sides. A few of our party had taken a few minutes out to look around the surrounding fields to see if they could find any shrapnel still remaining. A few lucky individuals came back with some twisted shards of metal that were still remaining to place on their mantlepieces when they got back to Blighty. During most of the trip, we were very fortunate to have had mild but sunny weather and we made the most of it while it lasted. Back on the coach once again and we motored down into the Ancre Valley, through the picture-postcard town of Beaumont-Hamel to one of the last remaining preserved battlefields in that area. 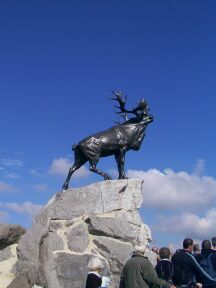 This battlefield, covering an area of 30 or 40 acres, was fought over by the Germans and Commonwealth troops from Newfoundland and this is where a memorial, in the form of a rearing elk atop a 30 foot high mound of rocks, was placed. From the top of the monument, you could clearly see the trenches that had been dug by Newfoundlanders and in the distance, those dug by the Germans as well. This was also one of the few areas that had not had the shell impact craters filled in and you could see how heavily marked the surrounding area had been marred by exploding shells. After looking around the preserved trenches which made their zig-zagging way through the soil, the reason for the trenches switching direction every 10 feet or so was because if any enemy troops made their way into the bunkers, only a few soldiers could be attacked at any one time instead of the whole length of the trench being open to attack, we then walked the carefully marked and fenced-off route around the periphery of the battlefield. The reason for staying to the path was obvious as we were told that there was still a lot of unexploded ordinance buried in the ground and could still explode after all this time. There have been reports that sheep that were grazing on the land had come a cropper due to treading on a unexploded shell and had come to a rather messy end! Halfway around the edge of the battlefield, there was one solitary blasted trunk of a tree standing alone and back in those days, it was known as the Danger Tree. 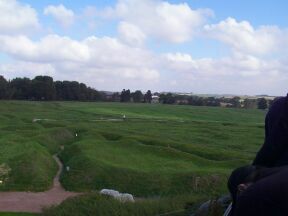 If you had made it that far, you were in with a good chance of engaging in hand to hand combat with the German troops. Small consolation to those who had made it that far, considering the amount of shells raining down and machine gun fire all around. At the rear of the German positions was another large crater and we were informed that during hostilities all throughout that region, teams of British Army Royal Engineers, working in teams day and night, would tunnel under the battlefield to where the enemy positions were and dig out a small reinforced cavern in order to lay tons of explosives under enemy positions. When triggered, the end result was normally devastating and the Hawthorne crater, as it was named, was the result of one of the numerous digging expeditions by the 'Sappers' of the Commonwealth Forces. As the saying goes, the best is saved until last and after another short coach ride, we were at Vimy Ridge, approximately 2 miles from the town of Vimy and several miles north of Arras. 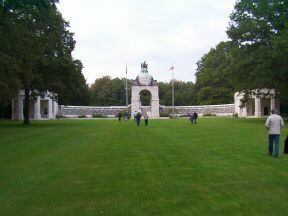 Canadian troops were the main Commonwealth soldiers in combat here and the memorial to commemorate them is spectacular, to say the least;a vast white stone column, looking like it had been split asunder by a mighty blow, with effigies of fallen soldiers in the yawning gap, sat atop a plinth some 20 feet high reached by steps. All of this was surrounded by a small wall with a sheer drop on one side to the immense panorama of the Doay Plain stretched out before us. A poignant symbol of this memorial was a statue of an old woman with her head bowed and her beseeching hands raised in prayer, sited on the wall, looking out over the Plain to the horizon to see if her fallen son would ever return to her. A lot more can't be said as this was our last port of call on our trip and it was then back on the coach and a leisurely drive back to Calais to pick up our ferry back to Dover. Over the course of the three days that all of us were together on the coach, we had come from being strangers to people who were united in having a shared emotional experience. I came back from my travels in France and Belgium with a lot of memories, some of them amusing and a lot of them sobering at what took place all those years ago. Enjoyable is not a word I would use to describe this trip but it has opened my eyes to what happened in those four blood-soaked years on the fields of northern Europe. All the grainy film footage from that time you might happen to watch cannot sum up the reality of the events that transpired and the sheer amount of human life that was taken in that period of time. "...They shall not grow old, as we that are left grow old.